ProQuest’s advisory boards enable open and exploratory dialogue between the company and its customers, helping to ensure that technology and content is aligned with library and researcher requirements in a rapidly changing market environment. ProQuest is committed to enhancing the day-to-day lives of researchers and working with librarians to support their key roles in helping to improve research outcomes. ProQuest has set up the advisory boards in order to gain a stronger understanding of the needs of their customers by having interactive discussions on trends, priorities, and what developments are essential to meet the growing demands of their patrons. 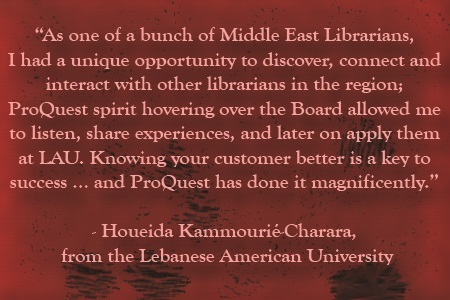 The members of ProQuest’s Middle East Advisory Board met earlier this year to discuss the importance of collaboration between vendors and libraries. 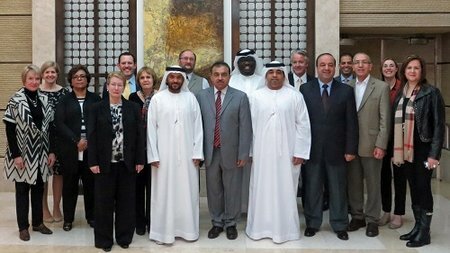 Twelve influential figures from the academic library industry within the Middle East met with key members of staff from ProQuest to deeply explore, address, and discuss the needs of libraries and their users in the region. 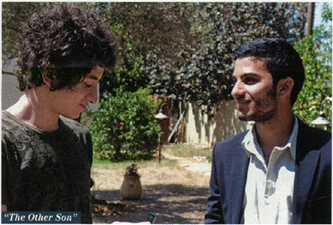 Members of the Middle East board are from academic institutions and public libraries across the region including Qatar, Saudi Arabia, The United Arab Emirates and Bahrain. The board meeting provided an opportunity to collaborate and learn from each other’s experiences across the region while partnering with ProQuest on the development of their regional strategy. The members of the board provided insightful feedback and guidance for ProQuest during the two-day meeting and suggested some key elements which are essential for supporting libraries and researchers in the region. With the constantly changing needs for libraries today, resources must keep up with the trends and needs of researchers and students across all subject areas. ProQuest is keen to ensure they maintain the technology and content to support this. Review a history of US foreign policy: ProQuest content that reveals "disagreement, debate and discussion"